We develop policy solutions for challenges facing society where our industry has a role to play – think how to insure automated cars and giving the public more transparency around their pensions, to name just a few. As a forward-thinking organisation, we work with government, regulators and policymakers, both in the UK and internationally, to ensure the insurance and long-term savings industry meets the needs of the public to the highest standard. We are the leading trade association for driving positive policy and regulation change in the insurance and long-term savings industry – benefiting both our 250 members and their UK customers. You’ll impact the lives of the UK public. Insurance and long term savings affects us all in one way or another and is a hugely important part of the UK economy. By joining the ABI, you’ll help our members offer the best, fairest and most transparent products and information to UK customers. You’ll also do you bit to support a British success story as our sector is a world leader. We’ve been instrumental in setting up practical organisations to provide solutions for people and the industry such Flood Re which makes sure flood insurance is affordable and we’ve driven forward the concept of a Pensions Dashboard so that in future, people can see all their pension savings in one place. We also campaign to keep insurance as affordable as possible and we prevented a rise in insurance premium tax in the Budget 2017 with our award-winning #IPTsUNFAIR campaign video and sustained engagement with Government. You’ll help get the right people together. Members take part in 85 committees and working groups where they can discuss and contribute to shaping policy. We also host regular events for our members, government bodies and regulators. These cover everything from Brexit to Autonomous Vehicles to cyber security, as well as events supporting those new to the industry and last year we welcomed nearly 2.500 delegates to our events. In 2017, we launched our Talent and Diversity network where we meet with members to share ideas around how we can best support diversity and inclusion in our industry and we reach out to colleagues just joining our sector with events targeting ambitious young professionals. We’re a collaborative bunch and work in a fast paced, friendly, open plan office in the heart of the City (don’t get us started on how good our view is). We work hard but have lots of fun along the way – think cheering loudly at each other during cyclothons, annual (and highly competitive) pétanque tournaments, crazy golf and daily drop ins to HR and Finance for a biscuit. Being a team of under 100, everyone knows everyone and the moment you step out of the lift on your first day, you’re guaranteed a warm welcome. We have daily fresh fruit, a buddy scheme and a terrace with incredible views of the City. In addition, our Sports and Social Committee arrange fantastic events throughout the year. Check out some of the photos on our Instagram. In addition, we have company Maternity, Adoption and Shared Parental Leave policies. We also offer Long Service Awards to celebrate particular work anniversaries. 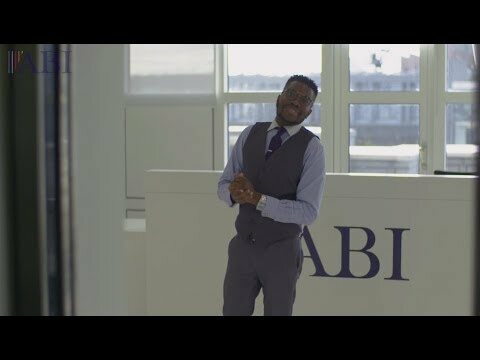 At the ABI, we see it as vital that we are a role model for our members. We’re an active voice in our sector and have signed up to various initiatives including the Women in Finance Charter and partnering with OUTstanding who support LGBT+ inclusion in business. In 2017, we also we launched a Talent and Diversity network where we meet with our members to share ideas around how we can best support diversity and inclusion in our industry. With regards to recruitment, we appoint the best person for the job, and selection will be against requirements and person specification that is relevant to the position. There will be no discrimination, and all candidates will be treated in fair, timely and courteous way. We are proud to be London Living Wage employer and all of our placements, internships and apprenticeships are paid accordingly.